My name is Peter K. from Papua New Guinea. I once bought a car in 2008 from your company in Japan and I receive monthly newsletter. I am really enjoying the car I bought and have recommended to some of my friends who want to cars. Most of my friends admire my little sports car. I once again would like to thank committee staff for they great help in shipping my car to PNG. I hope you are fine and the entire team at TCL. I am happy to tell you that my vehicle arrived at Dar es Salaam port as per your ETA on 28/03/09. My clearing agent completed all clearance formalities and on 01/04/09 I got my car intact with all accessories!! Thank you very much. You are a great team!! Good Afternoon to you. Another word of thanks from me. I am now driving the car around, home and to work. What surprises me is the Car was just what we were wanting. It is the first of these kind on the island. Hard to believe. A special thanks to Yuki Sugishita for all the great arrangements till the final outcome. I am very great full to have this one. My pleasure. Just to thank you for your good service. I received my car and i am very happy of it. God bless you. This is to inform you that the vehicle that i bought from your organisation has arrived. The vehicle is in a very good condition and its almost new. I drove 2000Kms fro Dar-es-laam to were I live without any problems even the tyres. I am very delighted with it and thanks very much for your professional assistance regarding the purchase of the vehicle. This is to thank you for the type of car you supplied me.It is very nice and comfortable,I am really driving comfortably. May God bless Trust Japanese vehicles and keep on serving your customers. We happy that the two units have been cleared and all intact.S/No.86381 and 86790. Thank you for your immediate respond. Attached files are photos showing my units from TCL and my own photo for your record as you requested. I would like to tell you that my beautiful almost new car arrived safely home on 8th April 2009. Its a pride to ride in it. My heartfelt thanks to you and your company for lettng own such a good car. Thank you for facilitating the purchase and conveyance of my car to my house. I am now driving it and its a perfect car. Looking forward to doing more business with you. Finally i have got my car. It is in very good condition and everything is intact. indeed you are the world's best car dealers. Keep it up. Thank you very much, i received the car yesterday its wondeful i am so happy and you have been so helpfull all the way. Looking forward to doing business with u again. Many thanx to the team. Hi! I would like to confirm that we collected the vihecle last week from Dar. How ever I was amazed at the speed of the ship that carried the vihecle. It arrived on time but we were late to pick the vihecle and so were charged for late collection. I hope to contact you soon when I shall be looking at getting a min bus. Thanks again and good bye. Customers do demand for Quality, Reliability, Trust, Assurance, Peace of mind and Comfort. It is evident this is true with Trust Company. No headache, no Heart breaks. Thanks. Maki Hyodo and All at Trust Company. The Pajero, our car is in very good conditions. Myself and family are very happy with the service from Trust Company. 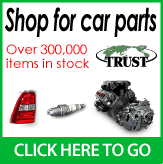 We recommend to our fellow customers to rely on Trust Company for their car purchases. They will always be healthy and happy. It is value for money dealing with Trust Company. I have not been able to find the right words of appreciation and thanking you and the entire TCL Team for the wonderful job you have been doing to me and my family. We are proud we received our vehicle in very good condition and we thank you very much. As I mentioned to you in my previous correspondences, on my own behalf and that of my family, we have great hope and trust with TCL and the entire team. Please keep it up and be assured of our support. We are representing you in marketing do not worry. We are planning to make another purchase from TCL in the near future. We thank you for all that you have done to us. Indeed it has been long time since i last heard from you although Trust keeps sending me news letters. Thank you again for what you and your company did. I no longer get attacks of headaches because my RAV4 is complete and am able to drive with pride. Thank you for being a trusted friend and a caring company. Greetings to all Trust Company staff, This is to confirm that I've received the vehicle 2day in perfect condition. Keep it up. Yours sincerely, O. Munisi. Good Morning! Hope your ok and doing well,i just want to thank you and your collegues for those cars you send,I got all cars on 4/3/2009 and i'm happy with it,thank again and have good day.